Dragons in Magic are pretty much always game-winners if you can get the mana for them and then untap with them in play. Really, name me one Dragon you can't say that for. Moonveil Dragon is unique, however, in that it can kill your opponent even if it never attacks. Because its "firebreathing" applies to all your creatures, it's great in a token swarm deck as a finisher. Heck, even if you have one other creature out with it, it can make combat math a headache and deal frighteningly large chunks of damage where you least expect it. Especially if some of your other creatures have infect, or double strike, or lifelink, or trample, or any other ability that keys off damage dealt. I'd be proud to have a Moonveil Dragon headlining my red decks, and I'd be happy to have a full-size poster of this artwork. This is what makes the Innistrad block so great: a beautiful, majestic creature that would have no qualms about ripping your heart out if it actually saw you. Most dragons are very much individual stars, swooping onto clear battlefields or over crowded ones to end duels in a blaze of fire; I haven't seen many that get better in team settings. Moonveil Dragon lets many red creatures that are only strong early stay relevant later in the game, is a combat trick as long as it's on the field (even when it just attacked somebody and you're being attacked by a different person) and provides a use for cards like Sphere of the Suns and Rampant Growth much later than they would traditionally be good, without sacrificing its individual destructive potential. What's not to like? 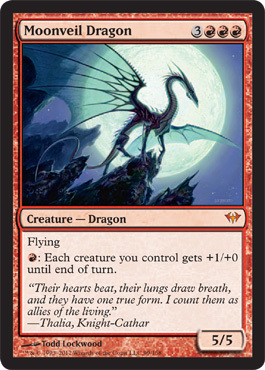 Today's card of the day is Moonveil Dragon which is a six mana Red 5/5 with Flying that grants all creatures you control +1/+0 until end of turn for each Red mana paid. Firebreathing for all of your creatures at the same cost as it would be for one is a very impressive effect. Being attached to a 5/5 with Flying is a positive as it provides a large body with evasion to benefit from it, but it is also a negative as it adds vulnerability to some removal. As a finisher this has potential and for mono-Red it is one of the more interesting dragons. While they don't often make higher end decks at least this can turn even a pack of kobolds into a game-winning offensive. For Limited a 5/5 with Flying is generally a bomb, one that can pump all of your creatures should always be a first pick. The triple Red in the cost is a concern, particularly in Sealed, but going as close to fully Red as possible should be the goal once you see this card. In Booster this is best in a first pack or when already playing Red, but as someone in the pod will most likely be running Red it should be hate drafted to keep it out of play. Welcome back to the Dark Ascension previews here at Pojo.com’s card of the day. Today we are taking a look at Moonveil Dragon. Moonveil Dragon is a mythic rare creature dragon that costs three generic and three red mana for a 5/5. Moonveil Dragon has flying and tap a red mana, creatures you control get +1/+0 until end of turn. Hands down Moonveil Dragon is one of the best cards to come out in Dark Ascension. A 5/5 flier that grants all you creatures a fire breathing pump just by paying it for the dragon is absolutely ridiculous! When properly used, red and white host some of the best first or double strike creatures in the game, and thus the pump would be greatly beneficial for them, since they hit first. Then, combined with Fling, being reprinted in Dark Ascension, you can get in a nice extra hit. Not enough time, or words to describe how much I love the Moonveil Dragon. And how amazing it truly is.